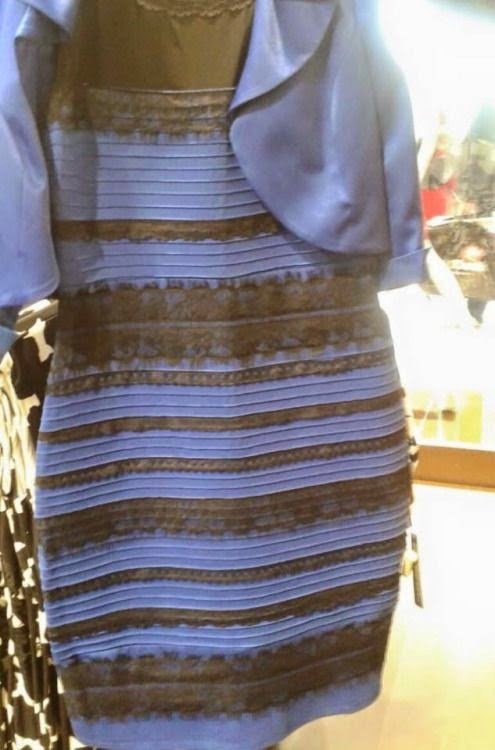 Surely you've seen #TheDress, which is currently the top trending Twitter topic and flooding Facebook feeds across the globe as people argue about whether the dress is blue and black or white and gold. I didn't know that this image was going viral when I shared the link. I'd only seen one other person talk about it, and it just seemed like a funny question to me. When my husband adamantly said it was blue and black while I saw white and gold (and we were looking at the same image on the same screen), I found it curious, not infuriating. Later, perhaps in different lighting, we each saw the picture the other way, and even though we don't completely understand the science behind it, I can accept and appreciate that this is one of many moments where our biological and cognitive functions as human beings just don't completely align. What is more interesting to me, though, is the way that this strange little blip in internet excitement is so indicative of larger cultural practices of meaning making. While this is all in good spirited playfulness, the reactions are indicative of a much more serious tendency. We need to be right, to convince other people of our rightness, to have that rightness vindicated and validated. To admit that someone else can look at the same dress, see something completely different, and also be right disturbs many of us on a deep level, and it's something we need to work on. Rhetorical theory borrows the concept of the gestalt from psychology, and it is in full swing with The Dress. A gestalt is a whole that is perceived as more than the sum of its parts, and a common illustration of it is the duck-rabbit image. Some people look at this image and see a duck. Others look at it and see a rabbit. 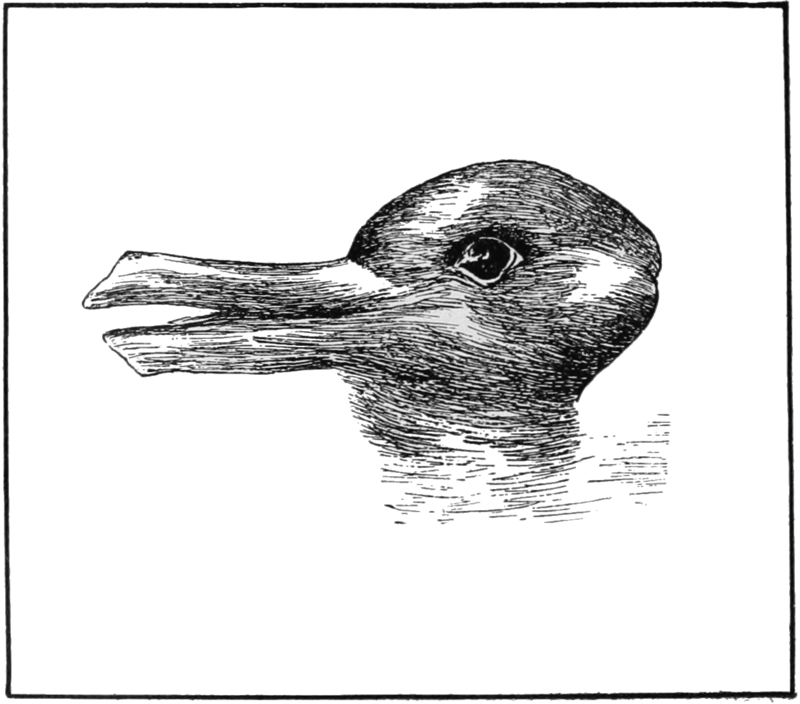 When someone on #TeamRabbit convinces someone on #TeamDuck to see it the other way (or vice versa), then that enlightened person is now able to toggle back and forth between the two images and see the picture as a whole as duck, rabbit, and most importantly something altogether new: an optical illusion. It is only through accepting that there is a second way to see the image that we an arrive at the third way. Louis Wetherbee Phelps writes that making this deliberate toggle between the two images "takes the viewer from literal-mindedness, in which he sees reality as having only one ('normal') aspect, toward polymorphic-mindedness, the ability to fluently shift perspectives on reality" (Composition as a Human Science 153). However, if we refuse or are unable to make that toggle, our single-minded brains aim to turn everything else into background noise. We are disturbed by the conflict and want a resolution. 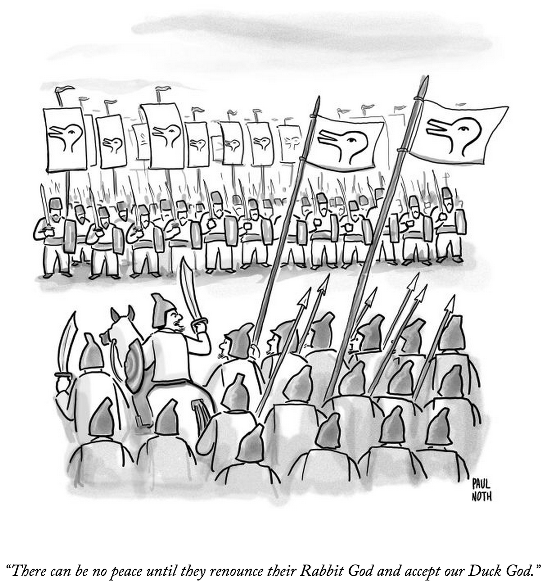 Peter Elbow calls on the gestalt when he says that "We are like rats who have been taught to see rectangles and circles. But what happens when they show us an ellipse? . . . for literary critics or political scientists, argument about whether they are looking at a rectangle or a circle will go on forever because there are no rules for proving a mistake: neither side can show there's something wrong with the other person's model . . . People just go on seeing rectangles and circles till they have the sense to start playing the believing game" (Writing Without Teachers 169). The "Believing Game" is Elbow's term for intentionally switching our perspective to believe what someone else is telling us, even if our instinct is to be critical. Once we've spent some time believing a perspective, we are supposed to switch to the "Doubting Game" where we can turn that critical lens back on. Doing this protects us from accepting ideas that are dangerous or harmful, but it also gives us the opportunity to learn new perspectives and to move beyond the either/or dichotomy to a gestalten third way of seeing. Richard Lanham says that teaching students to toggle back and forth between perspectives should be the aim of literary education: "This is a toggle to boggle the mind. It means that the two basic theories of language are placed in permanent oscillation" (The Electronic Word 82). This extends far beyond silly pictures of duck/rabbits or friendship-ruining dresses. Gloria Anzaldua writes in Borderlands/La Frontera about feeling this push and pull within her own identity. Her multiracial identity is conflicted as she feels on the borders of Indian, Mexican, and white. She identifies as queer and feels neither fully male nor female. At constant conflict with society's attempts to pin her down, she writes that people "caught between two worlds" go on to "unknowingly cultivate la facultad" (61). This is the term she gives for the ability "to see in surface phenomenon the meaning of deeper realities, to see the deep structure below the surface" (60). It's not a comfortable spot, toggling back and forth between realities. Anzaldua admits that it is painful and that after cultivating the ability she is "no longer the same person [she] was before" (70), but the ability to toggle is a key one to understanding one another and ourselves. When even our own identities are made up of conflicting perspectives, how can we do anything but toggle?